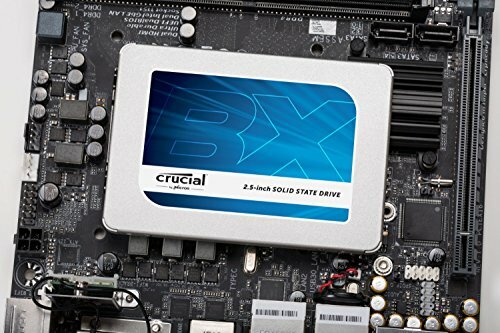 Crucial BX300 480GB Review – Keeping your expectations in check is not the most enthralling way to approach a new SSD, but it’s very much the attitude to have when considering a standard SATA drive, such as the Crucial BX300. For starters, it’s a SATA drive in an age when SSDs hooked up via the far-faster PCI Express interface are becoming ever more mainstream. Not only is SATA limited to a real-world maximum throughput of about 550MB/s, but its control protocols were never intended to jive with solid- state memory. That means random access performance is compromised, compared with the full potential of the latest SSD controllers and flash memory. 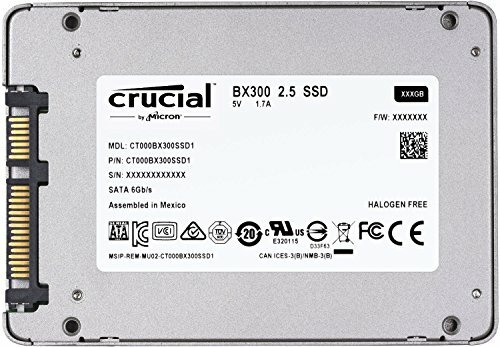 What’s more, the BX300 isn’t merely a SATA drive. It’s an aggressively priced one, sold as a value offering, rather than a premium performance proposition. This 480GB model should costs around when it lands Down Under. A top- notch SATA drive in this about-500GB category, such as Samsung’s 850 Pro, will hit you to the tune. Intriguingly, Crucial has wound back the clock technologically, and returned to MLC, or two- level, flash memory cells, each capable of storing two bits of data. Its previous budget drive, the BX200, ran with TLC, or triple-level. But this isn’t old-school planar memory. It’s 32-layer 3D NAND. Other highlights include Silicon Motion’s latest SM2258 controller chipset, 512MB of cache memory, and a write endurance of 160TB. 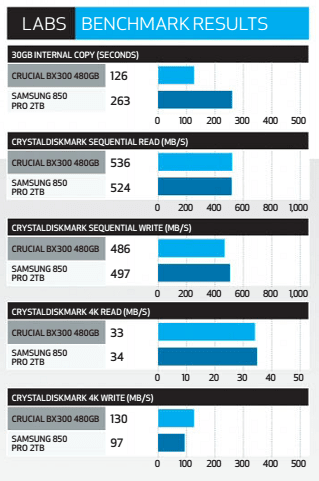 Peak speeds for the 480GB model are quoted at 550MB/s for reads and 510MB/s for writes. 4K random reads and writes are 95k and 90k IOPS, respectively. As for our tests, the BX300 cranks out some surprisingly good numbers. Sequential throughputs for both reads and writes are well over 500MB/s in ATTO Disk Benchmark. 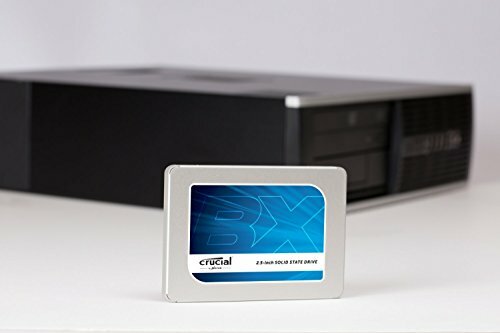 In CrystalDiskMark’s slightly tougher test of sequential performance, the numbers are still strong, with 536MB/s for reads and 486MB/s for writes. Even more impressive are the results in CrystalDisk Mark’s 4K random access test. 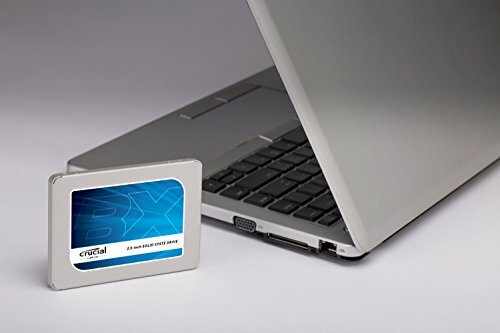 The BX300 spits out 33MB/s reads and 130MB/s writes. Those numbers compare favourably with a premium drive, such as Samsung’s 850 Pro. Of course, the subjective difference in terms of the computing experience delivered by various modern SATA SSDs has narrowed. You would be hard pressed to tell the difference in terms of how responsive each one makes a PC feel. Arguably of more significance is longevity, and that’s where the BX300 betrays its budget intentions. 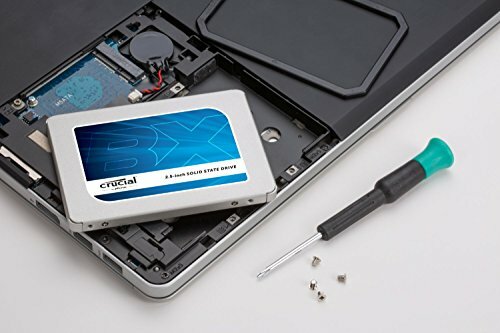 Crucial provides a three- year warranty, which matches other budget drives. However, Samsung’s 850 Pro comes with 10-year cover. In the end, then, you pays your money and you make your choice. 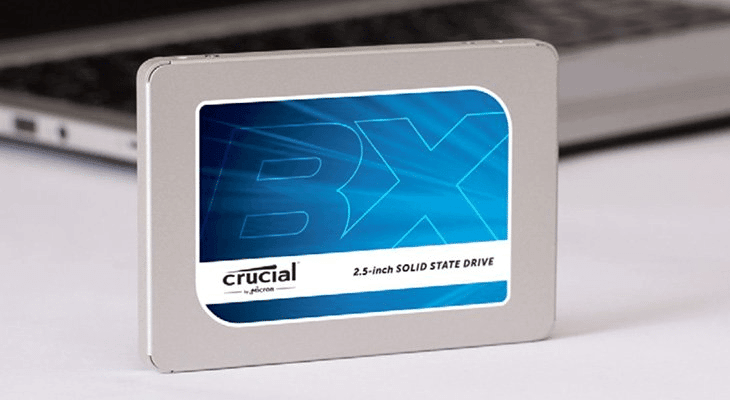 If you need an SSD with maximum staying power, the BX300 isn’t for you, and you’ll simply need to pay more. 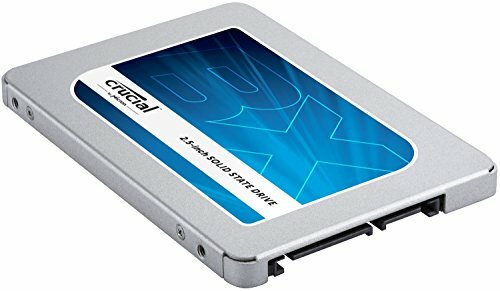 For most, however, three years is a decent lifespan for a cheap SSD. In all likelihood, this drive will keep on trucking for many years beyond. 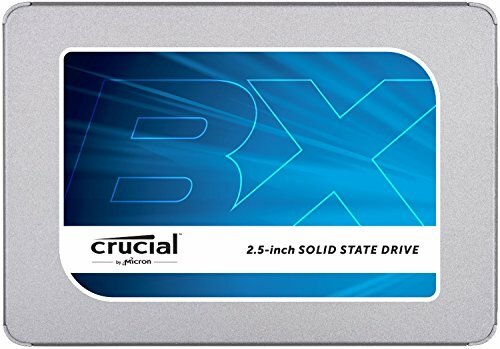 Combine that with very respectable performance for a budget SSD, and you have a pretty awesome value proposition. Just so long as you keep those expectations reasonable. Aggressively priced, but with solid all-around performance. It doesn’t do anything spectacular, however. Aggressively priced, but with solid all-around performance. It doesn't do anything spectacular, however.